When you hear of fans lining up five hours before tickets go on-sale, you may think it’s a reference to teenage girls anticipating the latest Justin Bieber concert. Whether or not these fans had Bieber fever, this particular ticket line formed before the matchup between Hill-Murray and White Bear Lake at the new Vadnais Heights Sports Complex on Thursday, Dec. 23. An estimated crowd of 1,500 crammed to watch the heated rivalry game between the Pioneers and Bears in what many expect to be a preview of the section championship game. 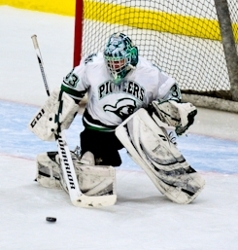 Hill-Murray prevailed, 3-0 -- one of the Pioneers’ 21 victories this year. If both teams make it to the section championship game, expect the attendance and action to double in the rematch. A rough start to the 2011 season plagued the Pioneers, as they went 1-2-0 in their first three games with the one victory coming against a Class 1A team, Duluth Marshall. The poor results early in the season had several believing this was not Hill-Murray’s year, but the Pioneers refused to believe it. With the exception of a 2-1 loss to Eden Prairie, Section 6AA’s top seed, on Thursday, Jan. 6, the Pioneers were perfect from that point forward. Hill-Murray went 20-1-1 in its last 23 games and earned the No. 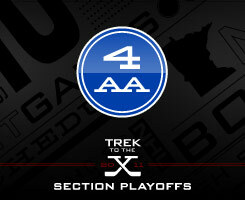 1 seed in Section 4AA. And that tie was a shootout victory over Edina, the defending state Class 2A champion, in the semifinals of the Schwan Cup Gold Division. The difference in the Pioneers from their early season team to their current squad is noticeable. 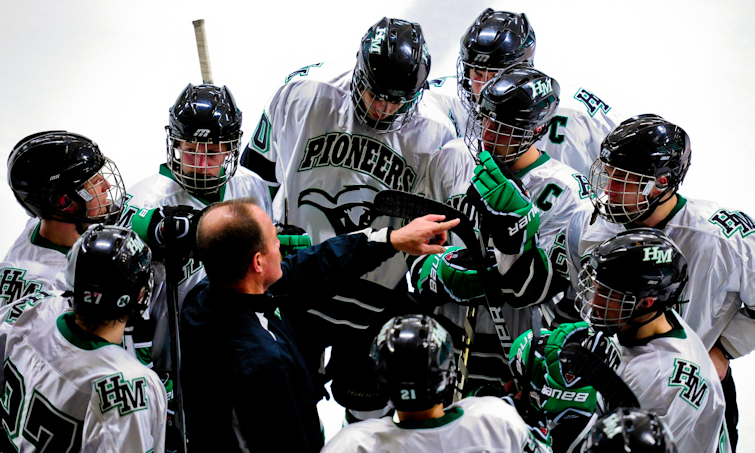 Hill-Murray coach Bill Lechner has rearranged lines throughout the season looking for the perfect fit. He might have found it on Tuesday, Jan. 15, when the Pioneers took on Holy Angels. The Stars were held to just 10 shots and six Pioneers scored as Hill-Murray defeated Holy Angels, 6-1. Perhaps the most dangerous thing about the Pioneers is their depth. Thirteen Pioneers have reached double digits in scoring this season. Eight of Hill-Murray’s forwards have 10 or more goals - Mr. Hockey finalist Ben Bahe (27), Zach LaValle (18), Bobby Bruski (16), Jake Guentzel (15), Kevin Becker (12), Luke Voltin (12), Loren French (12) and Ryan Holler (10). Kevin Schulze and J.D. Cotroneo lead a talented group of defensemen that makes life a little easier for Tim Shaughnessy, a senior goaltender with shutdown potential. Don’t count out No. 2 White Bear Lake just yet. The Bears have plenty of talent at the forward position led by Brandon Wahlin, Mac Jansen and Max Birkinbine. The three have combined for 130 points (76 goals, 54 assists) this season for White Bear Lake and will draw heavy attention from opposing defenses throughout the postseason. Bears’ goaltender Jared Schletty has put together an impressive season with a 13-3-2 record while allowing an average of 1.87 goals per game with a .910 save percentage. Stillwater, the No. 3 seed, is hoping to spoil a rematch between White Bear Lake and Hill-Murray. The Poines have a tough defense led by another shutdown goaltender in Blake Cates – who has posted an 11-3-1 record, allows an average of 1.91 goals per game and has a .932 save percentage. Defensemen Cody Corbett and Kyle Mogren are not only feared in the Ponies’ end but also in the offensive zone. Corbett is tied for points leader with 21 (9 goals, 21 assists) and Mogren is close behind with 18 points (4 goals, 14 assists). Not to be forgotten is No. 4 seed North St. Paul and the Polars’ dangerous duo of Zac McCarver and Shaun Kelley. McCarver leads North St. Paul in scoring with 47 points (22 goals, 25 assists) and Kelley follows with 34 points (14 goals, 20 assists). The section is Hill-Murray's to lose. The Pioneers have played a tough schedule and played well during the regular season against teams within the section. A possible injured Zach LaValle hurts Hill-Murray as LaValle is a 'Player to Watch' but the Pioneers - led by Mr. Hockey finalist Ben Bahe - have all the keys needed: depth at the forward position, solid defense and a shutdown goaltender in Tim Shaughnessy. If the Pioneers focus on the task at hand instead of looking ahead, they should emerge victorious. Many predictions point to a section championship game between No. 1 seed Hill-Murray and No. 2 seed White Bear Lake, but No. 3 Stillwater could surprise the Bears in the semifinals. The two teams split the regular season series - the first game being a blowout victory for the Bears and the second game going to the Ponies in a close 4-3 battle. Junior goaltender Blake Cates can be a game-changer if he steps up and plays well and the defense in-front of him is a threat at both ends of the ice.